Coinciding with this year’s Canada Day weekend, Canadian artist Douglas Coupland has unveiled his newest and arguably most ambitious project to date. Called The National Portrait, the large-scale artwork consists of hundreds of 3D printed portraits based on real Canadian people. The installation, which is being exhibited at the Ottawa Art Gallery until the 19th of August, has been in the works for some time as Coupland partnered with Canadian retail chain Simons in 2015 to invite people to participate in the project by having their heads 3D scanned. After touring various Canadian cities, including Montreal, Vancouver, Ottawa, Halifax, Calgary and more, Coupland has presented The National Portrait, the final phase of his crowd-sourced 3DCanada project. Speaking to Simons, Coupland explains how the idea for the 3D printed portraits was born from his belief that the accessibility of 3D printing technologies will change the landscape for portraiture and sculpture. The expansive piece itself comprises of 1,000 heads, all brightly coloured and arranged in an intriguing way. That is, not every head is 3D printed in the same way, some have been distorted slightly, which adds dynamism to the piece. The 3D printed heads do have one thing in common: they are all facing the same direction, looking to the future. On a more technical note, Coupland required a fleet of 15 3D printers to realize the ambitious project and used roughly 70 km of biodegradable plastic filament to make each portrait. After 1,700 heads were scanned on the 3DCanada cross-country tour, it reportedly took 11 months to 3D print the 1,000 pieces that are featured in the installation. 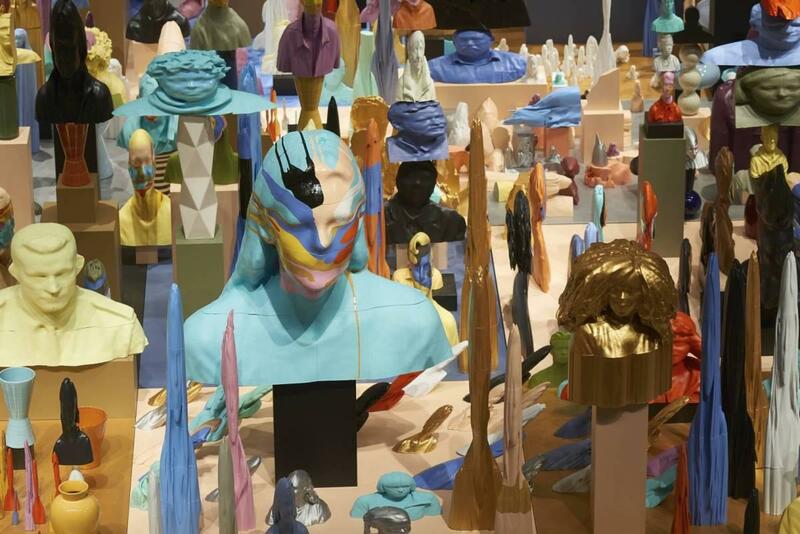 As mentioned, the 3D printed installation by Coupland will be on display until August 19th at the Ottawa Art Gallery in Canada’s capital city.